Our crafty friends over at Royal Caribbean Cruises, Celebrity Cruises & Azamara Cruises, all of whom offer Christmas and New Years festivities on board, have compiled a handy list of reasons why a cruise is the best way to enjoy (or escape) Christmas! 1. The festive spirit is taken care of; all you have to do is show up! When you take a holiday at Christmas, you also take a holiday from the stresses of Christmastime, meaning festive activities are taken care of by friendly onboard staff. 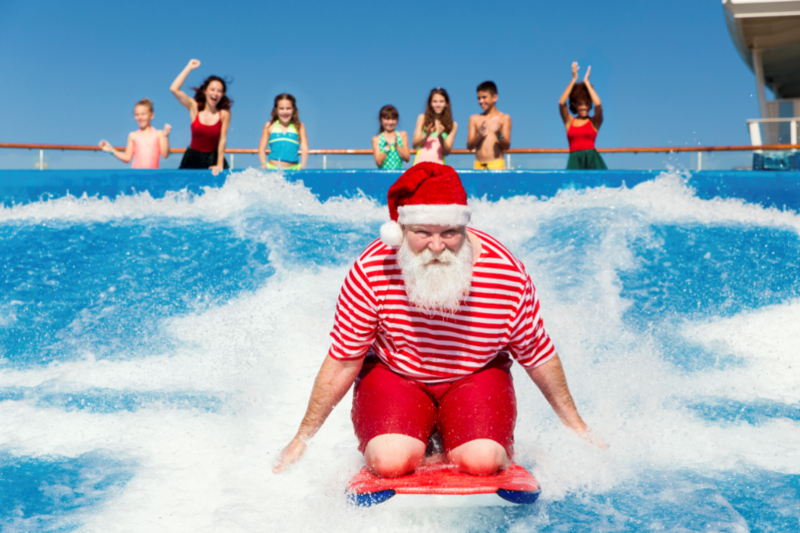 On a family-friendly cruise such as Royal Caribbean International, kids will not only have the opportunity to meet and get a photo with Santa, but might find him surfing the Flowrider surf simulator or rising 90 metres above sea level in a jewel-like capsule called the North Star! 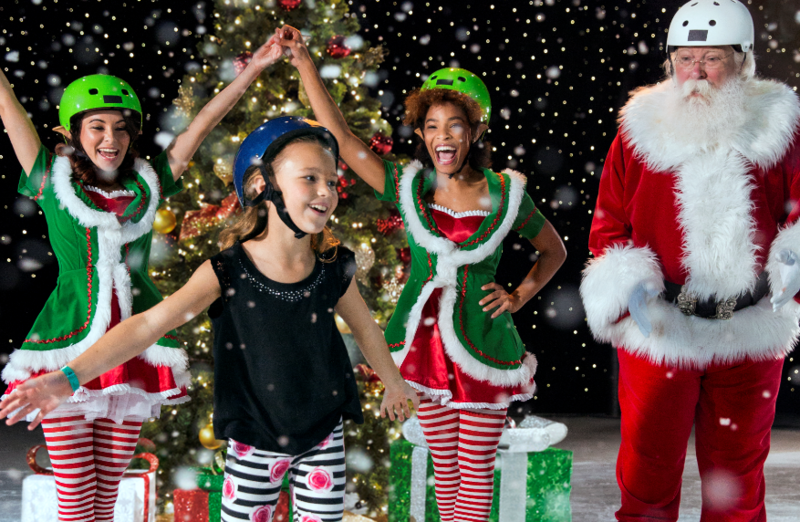 There is also an abundance of festive activities onboard, including Christmas moves, music and decorations, presents for the kids onboard from Santa and his elves, Christmas carolling by the cast, midnight mass on Christmas Eve and Christmas Day, Christmas Eve storytime, cookie decorating for families, and festive arts and crafts for the kids. Onboard more premium sailings with Celebrity Cruises, guests can enjoy exclusive Christmas shopping events in the onboard luxurious boutiques, including pre-Christmas sale shows featuring luxury brands such as Bulgari and Roberto Coin. There are also revitalising AquaSpa special holiday treatment promotions, a festive family Christmas card option at the photoshop, professional singer carolling throughout the season, religious services performed by Rabbis, Priests and Reverends on Christmas voyages, gifts to any children onboard from Santa, and a stunning New Year’s celebration complete with champagne and party favours. Onboard boutique cruise line, Azamara Cruises, kick back and enjoy Christmas carols by the cast in centrum at noon, photos and gifts from Santa, a Christmas Eve midnight unveiling of magnificently decorated gingerbread houses made by the Chef’s Crew followed by a video of Christmas greetings made by the whole crew, and fabulous festive decorations throughout the ship. One of the best things about a Christmas cruise is that you get to escape the stress of cooking and let the Chef’s talented crew put together a feast to remember, all without raising a finger! 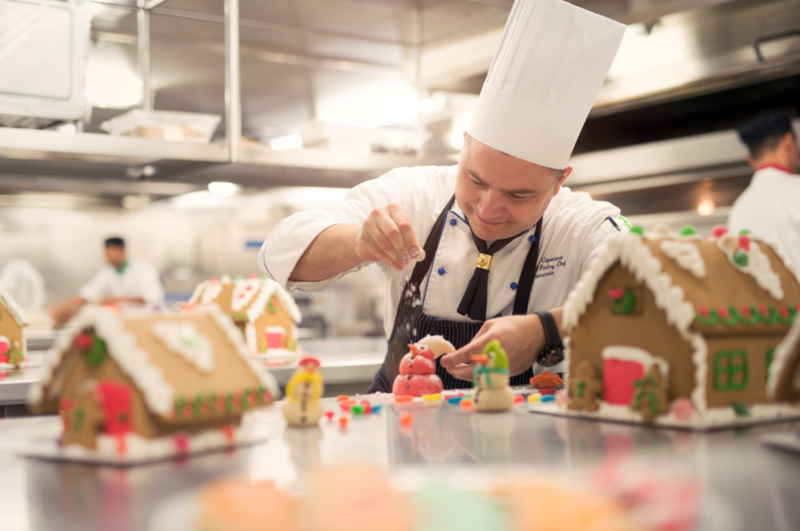 On a Royal Caribbean sailing, you can put away the blunt carving knife because the ship chefs prepare a spread of all the traditional Christmas fares. The buffets become a banquet of suckling pig, roast turkey and chicken, honey glazed ham, seafood, salads, as well as many other fine dining options in specialty restaurants. Royal Caribbean also often regionalises their food, meaning you are even likely to see a cheeky Pavlova on the dessert display. Everyone knows half of Christmas Day is spent in post-lunch siesta so what better place to spend it than on a lounger in the sun on the top deck. One of the best things about Christmas is quality family time, but it’s easy to get sick of each other by the time Christmas lunch rolls around – after all, the festive season goes hand-in-hand with family drama! The best thing about a cruise is that you can enjoy as much or as little family time as you need, with the option to enjoy a meal or activity together, or duck away and enjoy peace and solitude by the pool or in the spa. Onboard Royal Caribbean, you might choose to send the kids off to the Adventure Ocean youth program where they can enjoy the Teen Disco, Adventure Science Lab, Aquanauts activities, Imagination Studio or Adventure Ocean Theater. This way, you can enjoy the Casino Royale, one of the many onboard bars and lounges, a lounge by the pool with cocktails, or a quiet nap overlooking the open ocean. Meanwhile on a Celebrity Cruise, you could spend some quality time with your kids at a Mother and Daughter Paradise Massage, or a Father and Son Chill Out Massage, or take some alone time to enjoy Acupuncture, Body Wraps or facials at the Canyon Ranch Spa. Alternatively, reconnect with a loved one over a fresh meal from an onboard menu crafted by Michelin-star chef Cornelius Gallagher, from restaurants such as Tuscan Grille, Qsine or Blu Restaurant. On Azamara Club Cruises, you can kick back to live music by the pool or at one of the indoor venues, enjoying everything from superb solo artists, terrific trios, fabulous five-piece bands and classic guitar. Alternatively, take part in enrichment programs and classes such as seminars and lectures by onboard experts, Cruise Global, Connect local shore excursions, wine tastings with the Azamara sommelier or culinary demonstrations. You will also be treated to White Night Parties and AzAmazing Evenings, which are a fun way to connect and enjoy the festive atmosphere with family and friends. Between the food, presents, parties and activities of the festive season, Christmastime can often be a pinch to the purse strings, but it doesn’t have to be that way when on a cruise.